Three jet black Civic Si HFPs… there were also three white ones! A little while ago an invitation came into my email inbox asking if I would be interested in attending a session on driving vehicles with a standard transmission. Given that the invite was via Honda Canada, I mentally narrowed down the list of available Hondas – and Acuras – that are available with standard transmission. On the Honda side? Civic, Fit, Accord and the only hybrid with standard, the CR-Z. And on the Acura side? The TSX, TL and the new just released ILX. But there was something more intriguing about the invite. The concept for the event was to take those that drive standard would be transformed into drivers – by teaching the principles of safe, controlled handling and the art of the manual transmission. The giveaway? Our instructors were to be Daniel Morad, a World Karting Association Manufacturers Champion and who recently signed to Status GP in the newly formed GP3 series. The icing on the cake? Chris Bye. A former race car driver with a long and distinguished list of achievements to his credit and now president of Franczak Enterprises Ltd. So now, with an invite specifically from Honda Canada, the field was narrowed down to two possible cars: the Civic Si or the CR-Z. 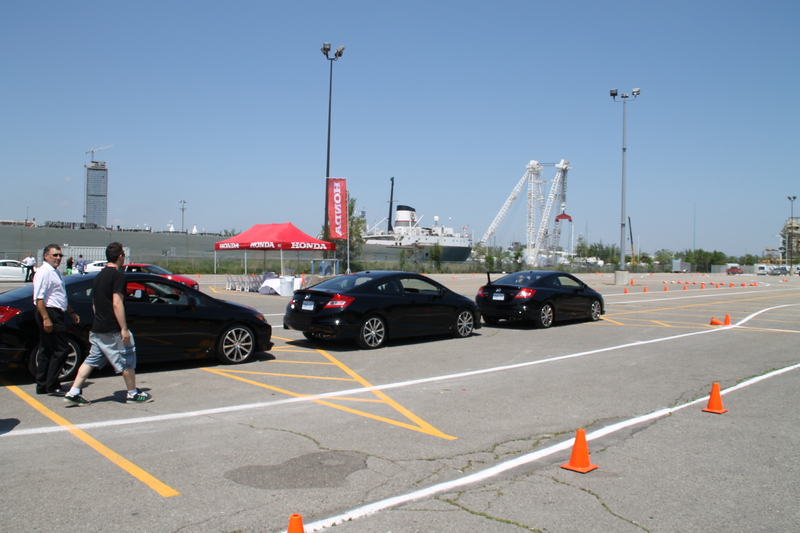 Imagine our surprise when we showed up on a glorious sun-drenched afternoon at Polson Pier, east of the heart of Toronto’s downtown to see three black and three white Honda Civic HFPs. Surprised? Sure, here were six of those vehicles – and only 200 have been manufactured and distributed for sale around the world! What is HFP? Honda Factory Performance (HFP) is about more than Honda’s commitment to crafting reliable, high-performance vehicles. It’s about fuelling excitement and exhilaration to those who know driving is so much more than getting from one place to another. It’s about taking Honda’s race-inspired engineering to a new level. It’s about transforming already head-turning vehicles into awe-inspiring works of performance art. Most of all, Honda Factory Performance is about the pure thrill of the ride. Each of these nimble warriors comes standard with a laundry list of equipment, but the heart and soul? Standard 2.4-litre, 16-valve, DOHC, i-VTEC® 4-cylinder engine with 201hp and 170 lb.-ft. torque; 18″ HFP alloy wheels with Michelin Pilot® Super Sport performance tires; HFP suspension package; and, HFP front, side and rear under body spoilers. Not too shabby at all. We were going to have an afternoon full of fun and promise! Most people think they drive fast. Some even consider themselves to be speedy pseudo ‘race’ drivers. Frankly, while some did impress, most of us, although we might have the ability to double declutch and employ the classic heel-toe manoeuvre, at the beginning of the afternoon, we were all rank amateurs. Learners, really. However, all was not lost. Some classroom-like instruction and then time on a make shift track with terrific instruction and practical pointers soon made a huge difference in our respective driving styles. By the time the afternoon was over, everyone, men and women were totally jazzed and in possession of a much better understanding of driving a standard transmission car. And not just fast. We learned control. To think ahead, to visualize next moves… all very Zen-like for sure – but it made a difference. Even now, a couple of weeks after the fact, as I zip onto a highway on-ramp, I can hear either Daniel or Chris’ voice in my mind, repeating simple instructions, over and over ultimately making me and my passengers feel safer somehow as I negotiate and better appreciate the camber and line of the ramp. Thanks, everyone. Lessons well taught – and well learned.